Marketing and sales alignment is something we talk about regularly at Sherpa…this is because ”wasted marketing efforts due to misalignment between marketing and sales costs $1 trillion a year”. That is a vast amount of money going down the drain due to poor lead management and follow up. Marketing teams generate leads for their sales organisations, but an alarming 79% never convert to sales, partly due to a lack of nurturing. So, what can we do to improve this? Using insight to refine and plan the follow up process is integral. Which is the best day to follow up? What’s the best time of day to follow up? So according to HBR, Wednesdays and Thursdays and the best day to make contact, and the best time of day to call a lead is towards the end of the day around 4-5pm. Interestingly, when it comes to picking up the phone to a new lead, you're 400x more likely to get a response if you do this within the first 5 minutes of them downloading the content. 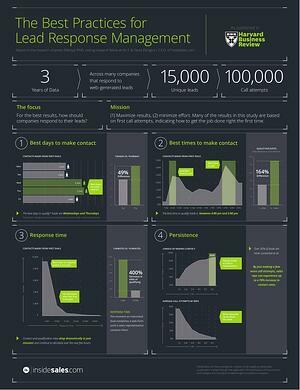 The odds of your lead answering your call after 10 minutes reduces significantly. While we're on the topic of following up leads by phone, the statistics reveal that you've only got a one in ten chance of getting through to your lead on the first attempt - whereas your chances increase by up to 90% if you are in the 3% of sales people to try as many as six times! However, this data is now three years old…so does it still apply? Absolutely. CallHippo carried out a survey in 2017, which looked at 24 weeks of data across thousands of companies and found that their results still correlated perfectly with those publicised by HBR. CallHippo identified that there was a 46% better success rate for calls made on a Wednesday compared to those made on a Monday. Friday continued to be the least successful day for sales calls. The only real difference in the studies is that CallHippo specify that you will still have an increased success rate of up to 450% if leads are called within one hour of downloading content, but the message is still the same - ensure your inside sales team are primed and ready to get on the phone and be dynamic in their follow-ups. Wednesday is the best day to call your prospects. The best time to call your prospects is between 4-5 PM. The second best time to call your prospects is between 11am-12pm (however, there were 71% more conversions between 4-5pm than 11am-12pm). Prospects should be called a minimum of six times. The best time to call your prospects is within an hour of the lead showing interest in your product. So, is it all down to sales? Absolutely not. Hubspot released their 2018 State of Inbound report last year (you can check out my summary of their findings here) and one of the stand out points was that 75% of companies wanted to close more deals, but only 48% prioritised the efficiency of the sales funnel. Creating a more efficient sales and marketing process would without doubt lead to more sales. Just ask the research bods at Marketo and Reachforce who found that businesses are 67% better at closing deals when sales and marketing work together. Both sales and marketing then have shared onus on guiding the customer to the required outcome, through end-to-end campaigns, delivering the right message, at the right time for the customer and maximising the likelihood of closing deals. In fact, “organisations with tightly aligned sales and marketing functions experience 36% higher customer retention rates and 38% higher sales win rates” according to MarketingProfs. Giving a shared responsibility over lead nurture and employing techniques such a lead scoring will also maximise resources. Persistence, planning and prompt follow-up are therefore crucial in a successful sales process. How does your company shape up on lead nurture, management & follow up? Read more about the IT Buyer's Journey to maximise the opportunities that lead to conversion.